The Walking Dead Review: "What Comes After"
Remember in season 6 of The Walking Dead, when the show clearly implied the apparent zombie death of Glenn, only to retcon it immediately after via the old “he crawled under a dumpster” dodge? Remember how, at the end of that season the show then pulled another fast one by forcing you to wait a year before they revealed which member of the group a debuting Negan had killed? Jesus Christ, people. Did I really just watch 70 minutes of a guy “dying,” only for him to not end up dead at the end? Did that just happen? Is this what happens when a writer sees Rian Johnson praised for “subverting expectations” and decides that straight-up lying to the audience is the best way to get people talking about your show? EDIT: Apparently, Rick has been flown out of this TV show and into a series of three AMC TV movies, because we are living in the stupidest possible continuum. As I sit here typing these words, I can scarcely believe that anything I saw in those last 10 minutes actually happened. The episode had seemed so very much as expected through the first 60. The series of flashbacks started strong, with a sit-down between Rick and Shane that narratively needed to happen, followed by a series of increasingly watered down conversations that bottomed out with Andrew Lincoln standing in a pretentious field of bodies talking with a green-screened Sasha—a character he had no particular connection with—about dubious psychobabble. Never mentioned: Rick’s former wife Lori, who I guess the show doesn’t want you to ever think about again at this point. The motif of repeated phrases, “wake up” in particular, was hammered home to the point of redundancy, and I can only imagine that most audience members were simply asking the show to “get on with it” by the time Rick detonated that bridge. But then god, to throw away the poignancy of that death by implying that Rick survives! The sheer gall of it, dear readers. If you asked 1,000 people on the street if this was a satisfying conclusion to this character, surely 998 or more of them would say “of course not.” What were the showrunners thinking? 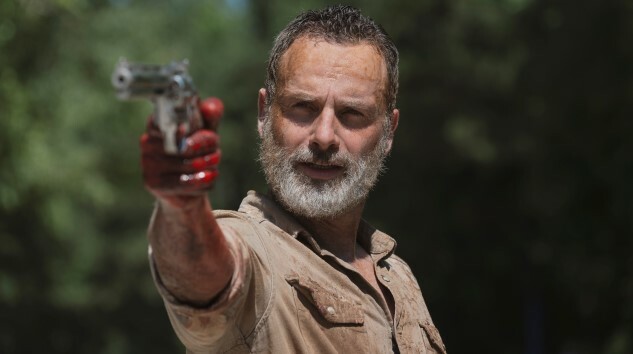 Pictured: Rick Grimes, who is apparently not dead after all, despite this being his “last episode.” Not pictured: Logic, honesty in advertising, tact. There are still so many other talking points to discuss here, that I need to fall back on bullet points. — The Jadis subplot doesn’t disappoint, in the sense that it has actively resisted any kind of logic with a singleminded fervor that is beyond belief. What is an “A”? What is a “B”? Why did Jadis attempt to infect/zombify Gabriel last episode, before not being able to go through with it? Who the hell are these helicopter people, and why do they want random human beings? Do they want humans, or zombies? Why can’t we just have ONE character ask Jadis for the explanation that she could probably give in the space of two minutes? This isn’t a “mystery”; it’s willful disregard for the audience. — As evidenced by the last couple of minutes and a now older, gun-toting Judith (that Colt Python is obviously way too big for her), the show is undergoing another time-skip, only five episodes after the first 1.5 years passage of time. We know, then, that even if Rick survived, he was never able to return to his family. Given that THIS ENTIRE EPISODE was about Rick doing anything it took to get back to his family, are we supposed to infer that he was killed by this abducting group? It makes no sense that he would be happily living a new life somewhere. Obviously, if he was alive, he would be making all efforts to leave where he is and get back to his daughter, right? Why wouldn’t you conclusively kill Andrew Lincoln’s character, if he’s never going to be on the show again? — Because of the time skip, and because we’re all talking about Rick right now, what’s going under-reported is that this was apparently ALSO Lauren Cohan’s last episode, although it was previously reported to be episode 6. And man, what a bizarre way for Maggie to leave the story—which is to say, she didn’t leave the story at all. She had a very effective scene with Negan, wherein she realized she didn’t need to kill him because failure had already broken his spirit, but was I supposed to take something away from this episode that would write her out after the second time skip? Is she going to take up Georgie on her offer to just “go away,” and take little Hershel with her? Maggie Rhee is going to abandon everyone who’s left from the Grimes Gang, along with her own people at The Hilltop? Does any of that make any kind of sense at all? And only making things more complicated (and stupid) are the rumors that Maggie will eventually RETURN to the story, after the shooting of Lauren Cohan’s new ABC series, Whiskey Cavalier. I don’t know how you could reply to this with anything other than a Captain Picard facepalm meme. — The firefight that began between Carol and the armed Saviors toward the end of last episode apparently wrapped up completely off screen, with no important results of any kind, and is never mentioned. Carol is briefly seen running with the others toward Rick on the bridge, so apparently she’s okay! Did anyone who wrote this week’s episode even WATCH LAST WEEK’S EPISODE? — Finally, the preview at the end of the episode shows a few glimpses of the new time skip, from long-haired Carol to finally bringing in concrete evidence of The Whisperers, the next big villainous group faced by the survivors in Robert Kirkman’s original comics. Is it safe to say that no one is focusing on this in the slightest, though, when there’s so much to discuss in the bizarre treatment of “Rick’s last episode”? Bravo, The Walking Dead. You always manage to piss us off in ways that are new and exciting. I look forward to endless speculation for however much longer the show lasts that Rick Grimes will return IN EVERY SINGLE EPISODE. Boy, that’s going to be fun to cover.